1. Applicants should note that the appointments to be made purely temporary and they have no right for claiming any regular appointment at the University 2. No TA/DA will be paid for attending the interview/ or at the time of joining. Research Associate Vacancy – Last Date 09 May 2019 (Hyderabad, Telangana), University of Hyderabad (UoH) recruits Research Associate Posts. Ph.D. experienced candidates can apply. For both the JRF positions, i) any one of the following: experience in electrochemisty or synthesis and characterization of carbon allotropes, ii) interest in experimental work and fabrication of electrochemical cells, iii) interest to carry out regular experiments at ARCI (Hyderabad) and Parisarabio (Bangalore), the research partners in this project, and iv) UGC-NET qualification for position 1. JRF Vacancy – Last Date 30 April 2019 (Hyderabad, Telangana), University of Hyderabad (UoH) recruits Research Associate Posts. M.Tech., M.Sc. experienced candidates can apply. (i) Bachelor's degree in Civil Engineering from a recognized University / Institute; Plus (ii) Two (2) years of experience in designing and construction of buildings, roads, sanitary and water supply systems, including their maintenance In organized services / Statutory or Autonomous Organizations / Universities / reputed private organizations. (OR) (i) Three-year Diploma in Civil engineering from a recognized University / Institute. Plus (ii) Five (5) years of experience in designing and construction of buildings, roads, sanitary and water supply systems including their maintenance In organized services / Statutory or autonomous organization / University / reputed private organizations. Working knowledge of AUTOCAD / other relevant software. Applications are invited 'online' from Indian citizens to the mentioned Non-teaching positions on direct recruitment basis. Online portal will be open up to: 25.04.2019. However, the 'online' payment link will be active till 22.04.2019. (i) Graduation in any discipline from a recognized University. Plus (ii) Certificate in Lower stenography and Lower typewriting from a recognized State Board of Technical Education Plus (iii) Proficiency in Computer Applications. Intermediate (10+2) or equivalent with science subjects from a recognized Board. (i) Bachelor's degree in Library Science/ Library & Information Science. Plus (ii) Two (2) years of relevant experience in a University/ College Library. (OR) (i) Master's Degree in any discipline with a Diploma in Library Science. Plus (ii) Two (2) years relevant experience in a University / College Library. Desirable: (i) Four (4) years of post-qualification experience in the field of Library & Information Science. (ii) Knowledge of library automation software. (iv)One year course in computer applications. (i) SSC or equivalent with science subjects from any State / Central Board Plus (ii) Two (2) years of experience in a recognized hospital or a clinic of repute. Stenographer, Junior Engineer & Various (11 Vacancies) – Last Date 25 April 2019 (Hyderabad, Telangana), University of Hyderabad (UoH) recruits Junior Engineer (Civil), Senior Assistant (Civil) – Stenographer, Laboratory Attendant, Junior Professional Assistant, Library Attendant, Hospital Attendant Posts. B.E., Diploma, Graduate, 10th, 12th Passed, Post Graduate experienced candidates can apply. M. Sc. in Chemistry with minimum 60 % marks. Minimum 2 years research experience in a polymer chemistry laboratory. Interested and Qualified candidates with good academic records are requested to send their application along with detailed Curriculum Vitae by email to Prof. Tushar Jana (Email: tusharjana@uohyd.ac.in, with the subject line Application for the post for PA-III) on or before 20th April, 2019. (1) The appointment will not carry any weightage or claim or whatsoever for a permanent absorption in the university and without any liability on the part of the university. (2) No TA / DA would be paid for attending the interview. The short listed candidates will be invited to attend an interview at ACRHEM, South Campus, University of Hyderabad at a later date. Interview date will be intimated via e-mail. 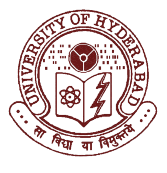 Project Assistant-III Vacancy – Last Date 20 April 2019 (Hyderabad, Telangana), University of Hyderabad (UoH) recruits Project Assistant-III Posts. M.Sc. experienced candidates can apply. The University of Hyderabad (UoH), one of the major institutions of higher education in India is largely devoted to postgraduate studies and is widely known for its excellence in research and for its distinguished faculty. Founded in 1974 with Prof. Gurbaksh Singh as its first Vice Chancellor, UoH – also known as Hyderabad Central University or HCU- has emerged as a leading centre of teaching and research. The large campus located near Gachibowli, which is the IT hub of Hyderabad, has immense bio-diversity and is home to over 75 varieties of bird, not to speak of the lakes and rock formations which give the campus a natural beauty.